This is your standard spoiler warning. 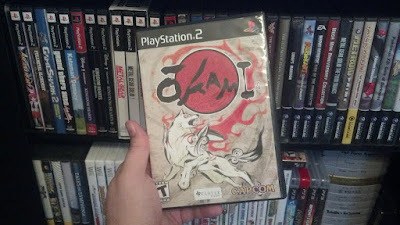 If you don’t want Ōkami spoiled for some reason then don’t even bother. 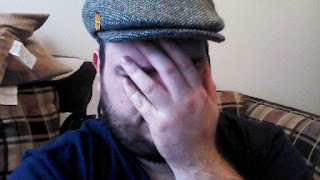 UGH… I’m still not quite over all the weirdness of last week. 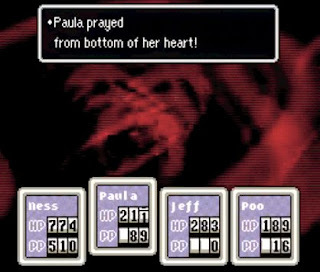 KoD randomly showing up, all the insanity in Earthbound, it’s really taking a toll on me. No, I gotta do this! Need to keep on schedule. My brain is so fuzzy I don’t even know what to review. Skyrim? No that will take too much brain power. 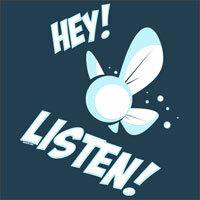 Tales of Symphonia? 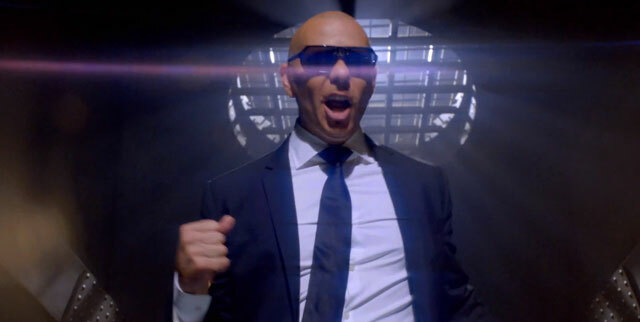 No I really want to do that one with Angel. Mother 3? NO CHANCE! OOOH I SHOULD DO A HALLOWEEN SPECIAL!!!! YEAH Let's see here what games have I played that would fit for that? Well there's The Nightmare Before Christmas: Oogie's Revenge.......and.. umm... well crap! I guess it’s off to the gaming cabinet! HMMM what to do what to do…. Hey what’s this? The more I think about it, the more I realize that this game is the perfect thing to follow Earthbound because both games share some amazing similarities in various aspects. 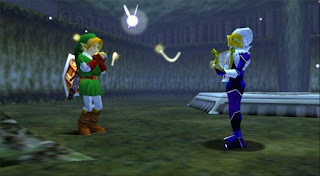 Both Earthbound and Ōkami sold fairly poorly upon their initial release while both receiving glorious remarks by critics, and have gained more and more fans as time passes. Both of these games are considered by many to be among the best games out for the console they were on. They also both thematically take themselves seriously when needed to but keep things lighthearted as much as possible without losing any depth of the world or the adventure. They also both were more prominent in Japan, Earthbound having been Mother 2 over there, and Ōkami with its Japanese themes, but I need to slow down before I get ahead of myself. You play as Amaterasu, nicknamed Ammy, for the entirety of the game. To normal people she appears as a regular white wolf, but to those gifted with the ability to see the Divine, such as apparently every single person who plays this game, sees her with her red markings. 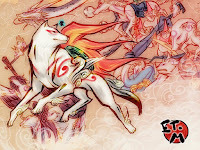 Ammy is the Sun Goddess of the Nipon region where this game takes place. She is also the reincarnation of the dreaded wolf Shiranui which I’ll get to in a few. So wait… she’s a goddess who isn’t immortal and has already died once? Looks like the creators attended the Stan Lee School of Mythology. I’m looking at you, Thor! Ammy is a very quiet and wise creature always wanting to help those in need, but that doesn’t mean she won’t show her opinions easily such as turning her head when a drunken man is speaking in her face, or getting offended by people’s comments. As I previously mentioned, she is the reincarnation of the dreaded wolf Shiranui. Those of you who are not familiar with the game may be wondering how the main hero of the game that you control could be the reincarnation of something known to be “dreaded.” And you may wonder what any of that has to do with the game that lies before you; but to understand the future we have to go back in time. HECK NO!!!! ANYTHING BUT THAT! Amaterasu originated from and once lived in the Celestial Plain. She was the ruler of the realm and life was good until one day the dragon Orochi attacked from nowhere. The remaining celestials escaped while Amaterasu dragged Orochi down to the mortal world near a small town known as Kamiki Village, knowing that only the chosen one, Nagi, could possibly defeat him. Orochi quickly made his home in the Moon Cave nearby and summoned all manner of demons to his aid. 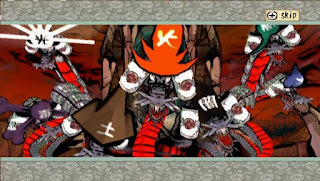 Quickly, Orochi began a reign of terror on Kamiki Village threatening to destroy the village unless a young maiden was sacrificed to him once a year so that he could consume her soul and continue living. This went on for 100 years. All Ammy could do was sit and wait till Nagi was born. She ran into a tiny person named Ishaku, who was a missionary to spread the word of the celestials to the mortal world. Ishaku teamed up with Ammy for her adventures, however not everything was easy. 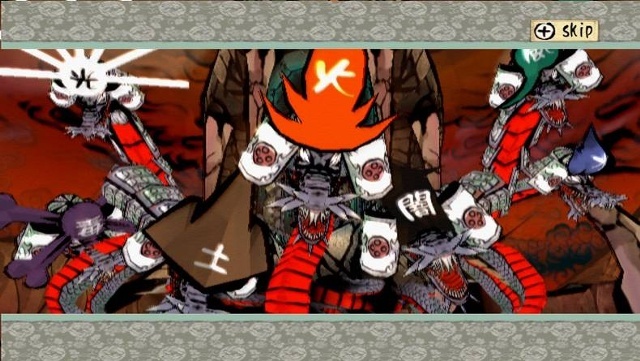 Since Ammy’s appearance was at the same time as that of Orochi, the villagers thought her one of Orochi’s spies sent to seek out the young maidens and would often become violent towards her dubbing her the name of Shiranui. After Nagi became a fierce warrior and Orochi chose the love of his life, Nami. 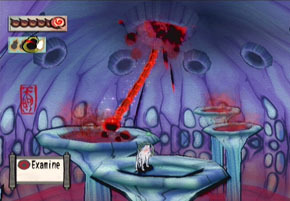 Amaterasu, Ishaku, and Nagi went into the Moon Cave to battle Orochi. Nagi was not able to defeat him but sealed him away with his sword so that the evil would be locked forever. Unfortunately Ammy was poisoned by Orochi and died in Kamiki Village with the elder apologizing for their behavior as she died. A monument was built to honor “Shiranui” and the world was at peace for 100 years. Wait… that’s not right is it? Sorry getting my ancient fantasy stories mixed up here. 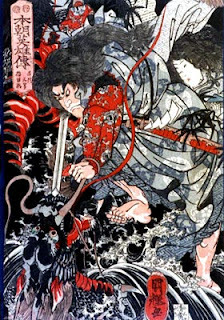 After 100 years, darkness spread over the land and the demons returned as Orochi appeared from his prison because someone had removed Nagi’s sword which held the seal in place. As the world became more and more poisoned with evil only Kamiki Village was left because of the protection of the sacred tree Konohana and its resident Wood Sprite, Sakuya. Sakuya, using the last of her power, resurrected Ammy from her stone statue erected of her to save the tree and village from despair. Teaming up with Issun, a tiny person of the same race as Ishaku mentioned earlier, the pair restored Kamiki Village. However due to the fact that Ammy was “in slumber” for a century her original powers as a goddess have been lost and she must regain all of the celestial brush techniques back. I guess it does make sense being asleep for so long you would have difficulty again or at least a crick in the neck. What is a celestial brush technique? 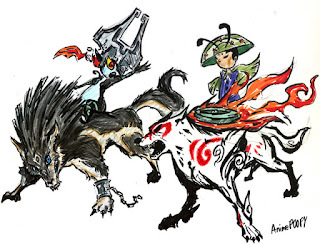 Well it’s a technique that Ammy can perform, theorized to be done with her tail, that draws symbols to create things or make things happen. 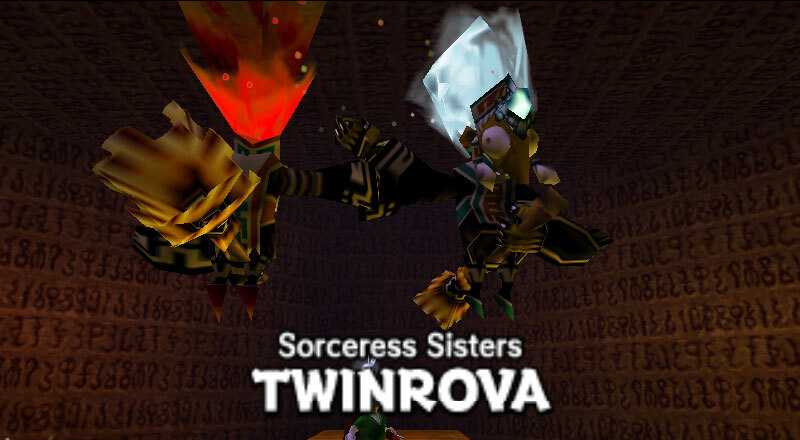 These can be anything from revitalizing flowers, to creating wind or fire, to summoning cherry bombs. She has to gain all thirteen of them back so that she can save the world, but more on them later. 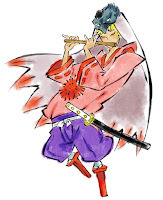 With the assistance of Suzano, a descendant of Nagi who is nothing like his ancestor but is rather a lazy drunk, they were able to leave the village and venture out into the world restoring many areas to their former glory. With Orochi awakened he chose Kushi, a descendant of Nami who is also a sake maker, as his sacrifice for that year. With the help of Suzano they defeated Orochi but a ghostly shadow rose from its body and into the sky. There was much left to do. For time’s sake, I will not go into all the details of the story since it’s a really long one, but Ammy and Issun go on many adventures together including ridding a man of an evil disease, meeting underwater people and a water dragon, meeting the fearsome Ninetails in battle, going back in time to change history of the original battle of Orochi with Nagi, as well as boarding a celestial boat on which has the final boss and demon to be defeated. Issun is Ammy’s partner throughout the game and is the grandson of Ishaku, who was Ammy’s partner 100 years prior. He was studying to be the new Celestial Envoy but felt his grandfather was not recognizing his skills as an artist, so he stole a drawing of Sakuya that Ishaku had done and left the Ponc'tan eventually landing in Kamiki Village where he spent most of his time talking to the villagers and sleeping in Sakuya’s kimono…specifically around her chest. ...Thought I was gonna make a joke there didn’t you? NOPE! Just going to let you make your own joke with that one. We meet Issun properly after Sakuya resurrects Ammy. Being only an inch tall most people perceive him as a tiny bug. He agrees to join Ammy in her adventures to learn all of her celestial brush techniques to master his craft. The rest of the time our diminutive friend just hangs around Ammy, talks to her and others constantly as Ammy doesn’t speak, and can be fairly annoying at times with all the dialogue he spits out. Wait… why does that sound familiar? I’m watching you game…. I’m watching you! OF COURSE! Why am I not surprised? Issun does have a couple of shining moments. After you reach Ponc’tan, on a search and rescue mission, you find that you need to go to the Spirit Gate and which is the gateway to the past. No one will take Ammy there, but Issun knows the forest and guides Ammy through it. The reason you need a guide is because if you take the wrong turn you have to start all over again. It’s a forest maze… a “Lost Woods” if you will. 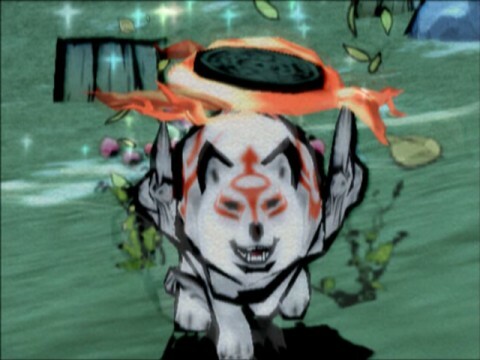 But of course, his crowning achievement is at the end of the game when he is separated from Ammy. He cannot get on the ark where the final boss is because he did not accept his destiny and can never board the ship. As Ammy gets downtrodden and beaten she loses her power and it seems that she is going to be defeated. However Issun has been traveling all over the land with his art showing people Ammy’s true form and how she is the sun goddess. He continues telling everyone about her so that they will believe on her. Together their beliefs and prayers are what give Ammy her renewed strength back to finish off the enemy. Why does THAT sound familiar too?? We don’t end up meeting Waka for a while and you can’t help shake the feeling that there’s more to him than meets the eye. For the majority of the game, Waka just randomly appears where you are about to be, plays his musical instrument, and gives you hints about where you need to go and what needs to be done to save the world from evil. Of course, why wouldn’t it be another rip-off? 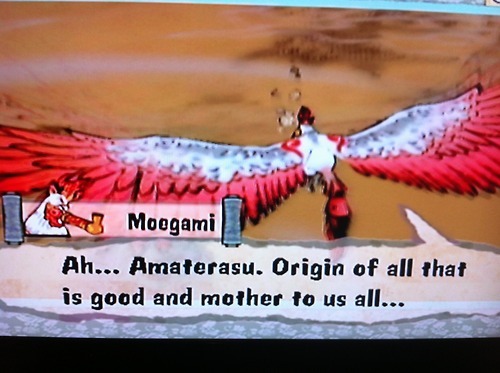 Waka, as it turns out first met Ammy when she still lived on the Celestial Plain. 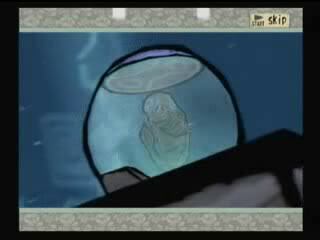 He arrived there on a ship and lived in peace with Ammy and the Celestials until the day Orochi showed up. Waka has the gift of prophecy and it was he who prophesied that Nagi would be the one to defeat Orochi. 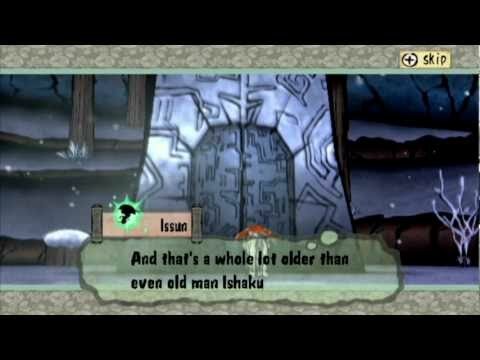 It is revealed that Waka is one of the last remaining members of the Moon Tribe, a group of people who lived on the moon till they were defeated. And here I thought moon people were two dimensional. One other interesting thing about him is that he uses French expressions like "mon amie" and such even though this is just an extremely Japanese based game. There’s some sort of cultural mishmash going on here I just don’t understand. Apparently in all versions other than English he uses English expressions, and they just changed it to French for our version. He’s a fun character who fights with you and you really end up kind of liking by the end of it all. 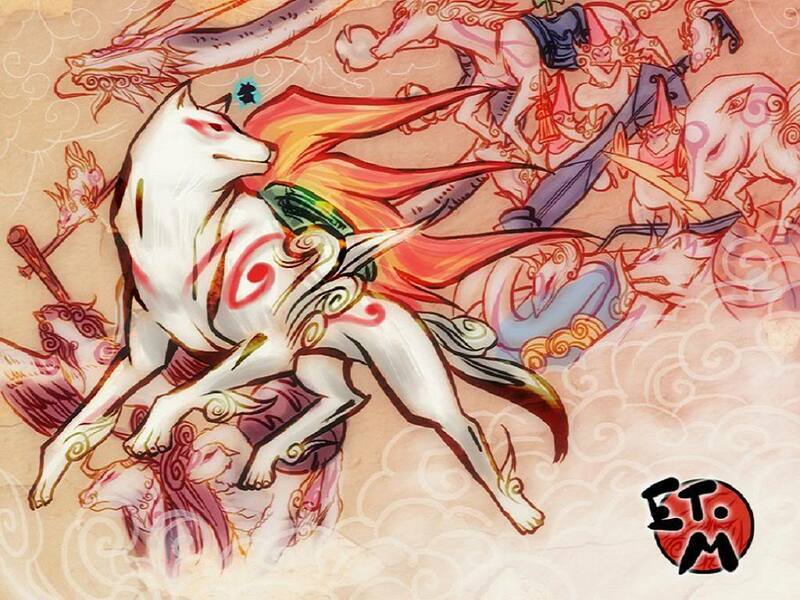 There are multitudes of really unique and interesting side characters but if we get into all of them, Ammy will have resurrected again. 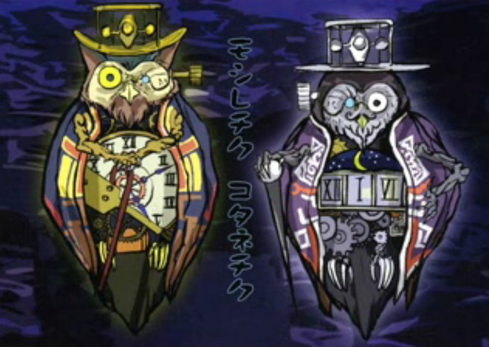 So instead let’s just talk about the 3 most memorable and influential villains. The eight headed dragon himself. 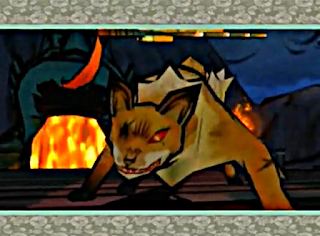 Much of what is known about Orochi I already covered in the Amaterasu section so I’ll be brief here. Orochi is a long standing enemy of Ammy and one which won’t go away. While in the gameplay you face him on 3 separate occasions. The second of these occasions is actually back in the past in which they find out that the legend of Suzano isn’t 100% true. The way that you defeat Orochi is… unique to say the least. You get him drunk. 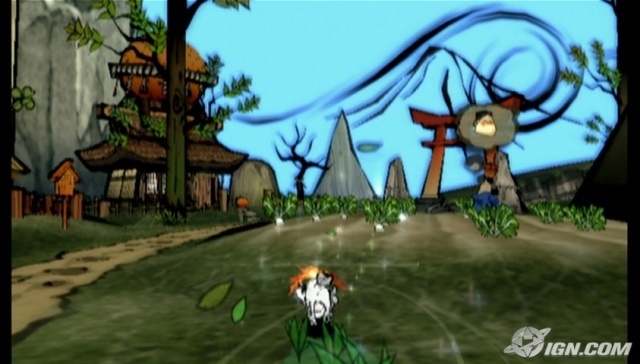 Each of the eight heads have to be stuffed with sake using the Waterspout brush technique and once they are dizzy and out cold you can attack the barrier surrounding him from normal attacks. Then once that is destroyed you have to get him drunk again, and attack him properly defeating each of the 8 heads. Ninetails is the ruler of the mysterious Oni Island and was promised to become the ruler of the Ryoshima Coast region of the world once all of it was plunged into darkness. However the king of the dragonian’s turned into a giant water dragon to defend his realm. The water dragon was mortally wounded but was able to steal the source of Ninetails’ power, the Fox Rods. Since she was in such a weakened state, she killed Rao, a priestess in the capitol city, dumping her body into a well, and taking her place till what time the Fox Rods could be recovered. That’s when Amaterasu appeared. “Rao” pleaded with Ammy to assist her in expelling the demons and in turn killed the queen of the realm. Ammy however was not fooled and attacked. Eventually Ninetails presented her true form and ran away to Oni Island. Ammy eventually found where Oni Island would appear once more, as it disappeared every morning and reappeared somewhere else the next day, and was assisted by the Queen of the Dragonians turning into a water dragon herself to break the barrier on Oni Island so that Ammy can defeat Ninetails. After going through Oni Islands, Ammy found only a constellation in the sky. After finishing it similar to the Celestials, Ninetails was summoned. You fight Ninetails in an area similar to that of the celestials as she is mocking them and calling herself a god. Ninetails fights with each of her nine tails and regular charging attacks. To defeat her, you must strike her with lightning causing her tails to appear as ghostly versions of Rao each with their own properties. Once each of them is defeated, Ninetails shows her true form as a beaten old fox with one eye. This form is easier to defeat and Ninetails runs away. You will later fight her again as well as Orochi on the Ark. There isn’t much that is known about Yami, in fact, we don’t even know about his existence at all till Ammy confronts Ninetails. He was hidden deep within the Ark of Yamato which Waka brought to the Celestial Plain 200 years previously. 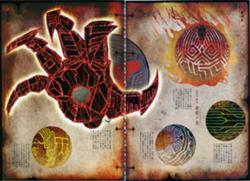 It is from his influence and the depths of the Ark that Orochi attacked to begin with. After Waka crashed the Ark into the mortal world, Yami’s influence fell on the world but he stayed in waiting and rest until the Day of Darkness. 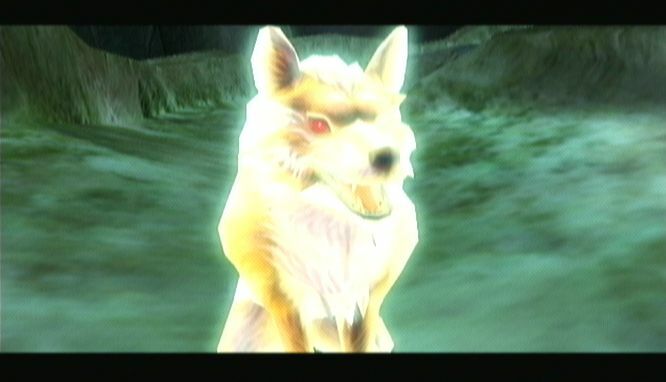 Once the Day of Darkness began, Yami awoke and stole Ammy’s powers to make himself at full power, but not before revealing his true form. And here I thought Klaus from American Dad was German, not Japanese. In the end, Ammy defeats Yami and boards the Ark with Waka headed for the Celestial Plain to leave the world in peace. If you haven’t figured out by now that basically the entire game is based off of Japanese mythology and folklore then I have lost all hope for you. Effectively, this game is a massive celebration of ancient Japanese stories and beliefs all into one game. Almost every single aspect of this game comes from something ancient. Don’t believe me? Let’s take a look at a few. Orochi – The entirety of the Orochi legend from 100 years ago is entirely based on the real Japanese mythological teachings of Orochi who is a legendary Japanese dragon that was slain by the storm-god Susanoo. Many other stories are very similar to this such as that of Hercules and the Hydra. Issun – the story of Issun is attributed to the ancient Japanese folk story about a couple who couldn’t have children so they prayed to the gods that they would care for any child that they would be given if they would just bless them with a child, and thus they were given a small boy that was only one inch tall. It’s actually kind of interesting how all of these stories are compiled into one thing that’s actually to some extent hiding the fact that it’s being educational. When a game can be educational and be subtle about it, that’s a win in my book. Of course I’m using the term educational very loosely. It’s as educational as Disney’s Hercules. If you really want to know more about these backstories do a Wikipedia search for this game and look at all the links. Or you can check out Chuggaaconroy's Let’s Play of the game in which he speaks often of the different mythological backgrounds of each of these elements throughout. It’s a very long watch but it might be informative for you. The first thing that basically everyone notices about this game is its unique art style. 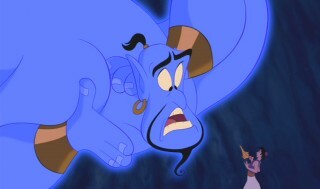 We were already used to a seemingly cartoony style with games such as…. 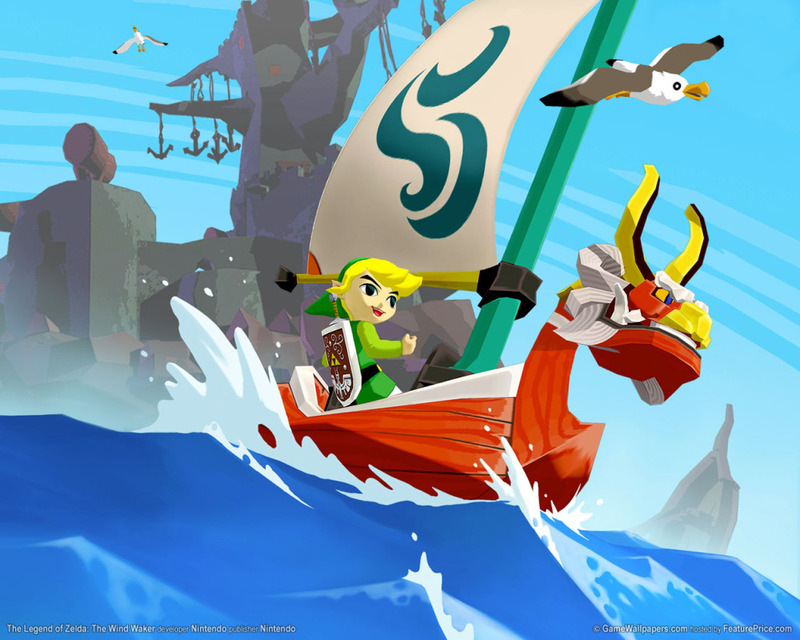 *sigh* Legend of Zelda Wind Waker. But this game adds a bit of flair as it is slightly cel-shaded but yet beautiful. 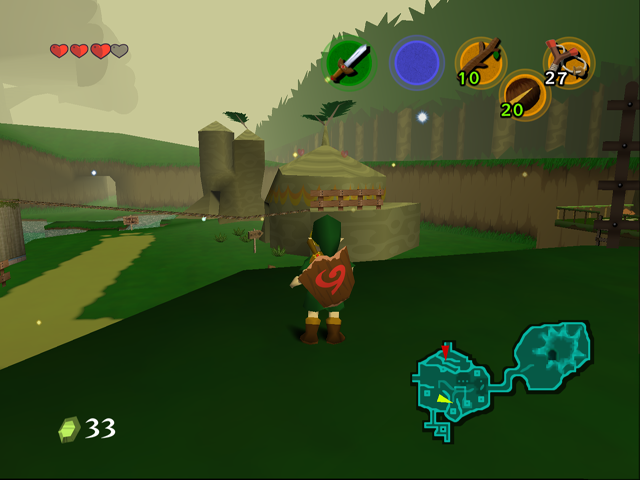 Originally the game was meant to be a more photorealistic 3D style that you see above on the left. However limitations of the PS2 hardware caused this to be too much of a burden. It was then decided that to be fitting with the ancient themes of the game that the art style would be inspired by ancient Japanese watercolor. It was due to this art style choice that they began the idea for the celestial brush. The developers wanted the audience to participate in the art rather than simply just view it. Honestly there’s nothing remotely funny I can say about this. This is extremely well executed and one of the greatest parts of the game. If nothing else can entice you to play this game, this would be it. Relying on spirits to give you additional powers. The list goes on and on. 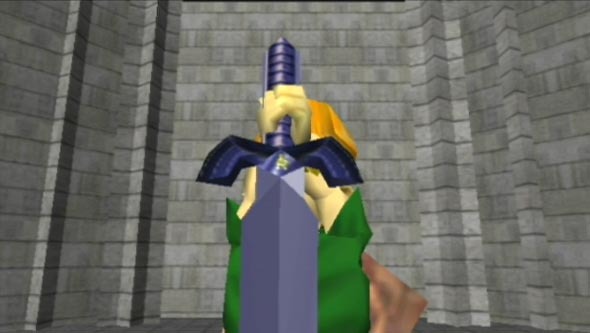 And if I haven’t yet pounded it into your skull, THIS IS EFFECTIVELY A FREAKING ZELDA GAME!! I’m sorry I was calling Spirit Tracks out for ripping off from their own series and maybe a couple things from Mother but this isn’t even its own series. Not to mention that originally this was ONLY for the PS2 meaning that this is completely ripping off another company AND another franchise entirely. Hideki Kamiya, who is an avid Zelda Fan, has said that the game was created with Zelda being an inspiration. I don’t think he realizes there is a difference between inspiration and shameless rip-offs. This game really is a great one. If you are a fan of The Legend of Zelda and don’t mind almost everything being lifted from that series and placed into a different vehicle then you will love this game. The Mechanics are solid, the bosses inventive, the atmosphere rich, and the art beautiful. Yes, at times this game can be extremely pretentious and most people who are avid fans can tend to be up their own backside over it but it’s really worth a play. It’s honestly worth every cent.